When I started as Marketing Coordinator at the beginning of August, I got a crash course in everything Slate Group can do with printing. Following which, I was handed the task of creating a themed Christmas present for Slate Group to mail out to you, our customers. I gathered samples and sat in front of my computer trying to concept ideas that would serve to further raise the bar for Slate Group’s Christmas gift. Basically, the parameters were to create something that would showcase everything we could do. So I listened to Christmas music starting in August and started perusing Pinterest for Christmas-themed anything. I jotted down ideas, screenshotted images, and developed some concepts. I definitely had a favorite and created a pitch just for that one, but decided I should probably have some back-ups, too. It was good to have back-ups. And not because any of the ideas were necessarily bad, but because the final design was developed from ideas from all three. 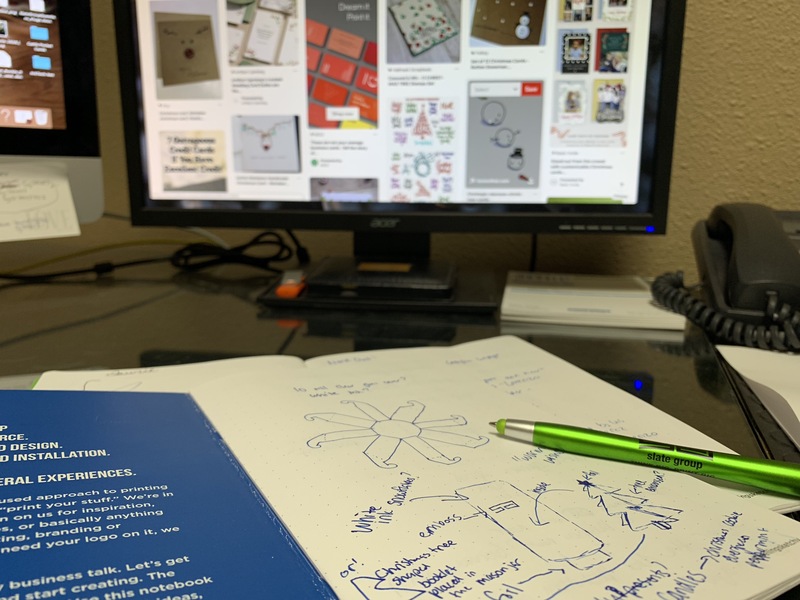 The initial steps to concepting the Christmas card: drawing and Pinteresting. We wanted to emphasize the “homey” feeling we strive to bring to Slate Group by developing personal relationships with our customers. And what better way to do that then to literally build a house? With a home and family theme in mind, I set out to begin designing different parts to the Christmas card. Which, looking back, was probably the easiest part. Besides four-color printing, we wanted to incorporate a custom die cut, raised UV, and foil stamping… things that would make our paper card bring the “home-y” feeling to life. In the end, we decided to separate the floor from the house walls completely. Originally, we were going to have the floor attached to the back wall and then tape just one side in order to make the house stand. (So the cut out shape would be L-shaped, with the floor folding up to connect to the house wall on one side only). However, our raised UV machine, the Duplo Ultra 200 UV System, has a maximum paper size of 14″ x 29″ and if the house and floor were connected the paper size would be need to be greater than that. So, we re-engineered our paper engineering. We separated the floor completely, and, in turn, made the tabs come up on the outside of the house to give the snow some dimension. The house still folded the same, but now we each piece could get raised UV textures like we originally planned. The “storyboard” concept for the Christmas Card. This part came after the design of card had started taking place. We had talked about what all we might want to put in the interior and exterior areas of the house and from there, we discussed what could benefit from having a slightly raised texture. Snow on the trees? Sure! A snowman? Yep! Text that needed emphasis? You bet. What about a wood floor and rug for the interior? Or Santa’s nose, even? Well, why not? The raised UV went through its printed approval stage. We chose the density for the different areas and made sure the textures felt as they needed to before approving the raised UV. Likewise to the UV, the foil stamping was developed as the design was close to being completed. The thing we knew for sure that needed to be foil stamped was the lights on the outside of the house and the ornaments on the tree. We recently invested in our Kluge ApexFoil machine and may have been a little too excited to use it..? Each color on each side requires a different die, meaning it had to run through the ApexFoil five times. But it was worth it. After the design was completed, it went to our prepress department where they set up the file to be produced. The house shape and the floor each needed a custom die cut ordered, along with each foil stamp color needing a custom die. The spot UV textures needed a digital masking layer. The house walls, on the other hand, followed a similar process with an additional stop at the foil machine. Foil and UV can be used on the same product, but the foil has to be stamped first before the UV can be applied. The vision was to initially create what you would see driving through neighborhood looking at Christmas lights. (And just as a side note, Slate Group does actually decorate for Christmas by putting up green and blue lights outside.) And upon opening the card, you would see even more homier features of a knitted rug, wrapped presents, and family pictures for decoration. After everything had been produced on the production floor, the entire sales team gathered in the conference room for hand assembly of the floor and house walls. 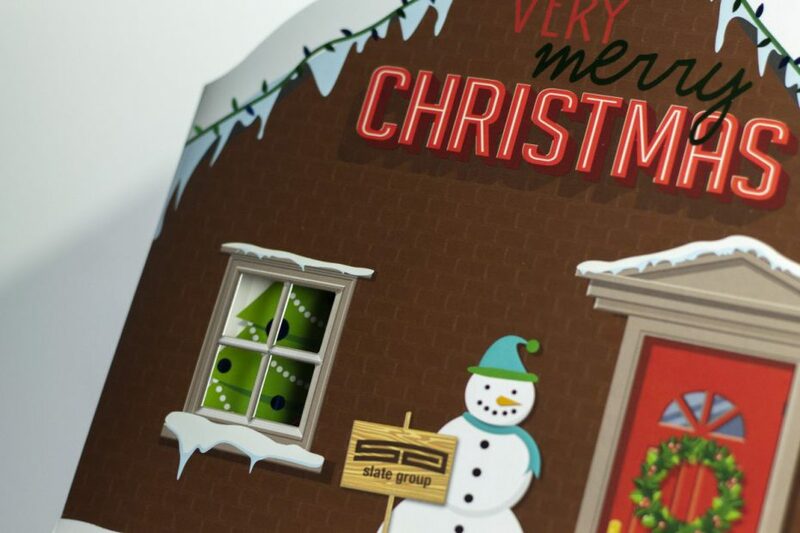 From beginning to end, almost everyone at Slate Group was involved in the Christmas Card production. For me, I followed the card through every stage of production, along with completing many hours of hand assembly (it goes a lot faster when the whole team is there, haha!). Through this, I saw exactly what our crew does to make sure the product is exactly what the client (me, in this case) is expecting it to be. From collaboration meetings to working late and extra press checks, our work family is what made the original vision for this card come to life. What’s in a… Acceptance Letter?